On Tuesday the 17th of November Jackie Tidey gave a presentation on Karen Armstrong as part of the Spiritual Reading Group session in the Carmelite Library. Here is the text of Jackie’s paper. Ten years ago I read Karen Armstrong’s memoir The Spiral Staircase after reading a favourable review. I’m not sure what resonated so strongly with me but it was probably her extraordinary honesty, her frankness in describing her spiritual and personal struggle. I found the last chapter of the book extraordinary and I have read it many times. For me the spiritual nuances she expresses are quite profound. I hadn’t heard of Karen Armstrong then but since that time she has become a prolific author and references to her writings and public appearances and utterances are everywhere. 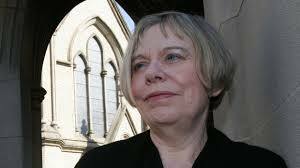 Karen Armstrong has become the go-to spokesperson for her views on religion and spirituality. In our increasingly secular Western world, and in many predominantly Muslim countries, she’s a well-known figure: on Youtube, on Oprah, at the TED forum, at the United Nations, speaking in St Paul’s Cathedral in London, addressing the US Senate, US Congress, in bookshops and university forums around the world. She spends her life thinking, studying and talking about religion and spirituality. It’s quite remarkable really: a woman who spent the 1960s living a fairly circumscribed life as a nun has been able, since leaving the convent, to become a sought-after commentator on spirituality and religious issues on the international stage. She has done this through sheer determination, necessity and use of her considerable intellectual gifts. Some background. At 17, to the astonishment of her family in Birmingham, who were not particularly devout … and who opposed what she wanted to do, Karen Armstrong joined a community of nuns called the Society of the Holy Child Jesus in England. It was the early 1960s and she found convent life harsh. In her first memoir Armstrong says she was required to mortify her flesh with whips and wear a spiked chain around her arm. On one occasion when she spoke out of turn, she claimed that she was forced to sew for a fortnight at a treadle machine that had no needle. Those were the days before the Second Vatican Council when no-one dared question the authority of those in charge. Karen Armstrong obviously did in that convent and she paid the price. To the Superior’s credit, the religious order did recognise she had an exceptional intellect and she went up to Oxford where she completed an undergraduate degree, a Masters and eventually, when she had left the convent, she worked towards a Doctorate. Seven years after she entered the convent, she left, pretty disillusioned, ill and fully believing she was through with religion and God. Karen Armstrong was 24 when she left the convent and she knew she needed to work to survive financially so she became a teacher at a university college in London (Bedford College) teaching English Literature, then, when her D.Phil thesis at Oxford was failed outright, and controversially, by a visiting professor her academic career appeared to be over. She could not continue teaching at university level so she began to teach at a Girls Secondary College in London. Then a further blow: the blackouts she had been experiencing for many years were diagnosed as temporal lobe epilepsy and she eventually lost her teaching position because of her ill-health. At that point she believed she was a total failure: failed nun, failed academic, and now failing health. Out of work and desperate to do something, anything, she decided to write a memoir of her life as a nun. It was an unexpected success and propelled her into the life of a minor media celebrity. From that came television interview work with the BBC and eventually work in Jerusalem on a documentary about St Paul with a Jewish TV director and crew. It was the first time she had any experience of other religions and learning that there were other ways to lead a spiritual life was a revelation. She discovered the Jewish idea of ‘orthopraxy’, right conduct, rather than the orthodoxy of the Catholic Church with which she was familiar. Here began her reconnection with a life of the spirit. Though she was ‘still convinced that God and I were through,’ something began to happen as she conducted her research in the Holy Land. She says, ‘St Paul, a difficult, prickly genius, had stormed his way into my affections.’ Visiting the various holy sites, she began to come alive spiritually as never before: ‘I felt as though I had been plugged in, like an electrical appliance, and had suddenly come to life.’ But she had another setback: a new TV series on the Crusades that she had been writing and researching for three years was cancelled when funding ran out. Once more she was back to zero, forced to reinvent herself: She was again desperate to work on something to convince herself that she still had a future. That ‘something’ was this book A History of God, a book everyone warned her against: ‘Karen, don't write this book now! You need to do something more mainstream,’ one publisher pleaded with her. A book on God seemed like an ironic choice for someone who had fled a convent, but ‘at some inchoate, unconscious level, I felt that God and I had unfinished business’. Karen Armstrong has now written twenty-five books. Of those I have read the ones I would recommend are: The Spiral Staircase, Buddha, A Short History of Islam, The History of God, The Case for God, Fields of Blood. I’ve also read her books on the Mystics, and 12 Steps to a Compassionate Life. There’s also a new book just out on St Paul called St Paul: The Misunderstood Apostle. St Paul hasn’t had a good press in recent times and this, her second book on Paul, is another attempt to reinstate his reputation. Karen Armstrong knows much about all the religions of the world, how they came to be, their founders, how they spread the word, how their influence has waxed and waned, the power shifts in their hierarchies, their followers. She has a challenging understanding of the purpose of religion and suggests there is not much difference between religious identity and human identity. Being religious is like being hungry or thirsty. It is inevitable because we all wrestle with ‘nothingness’. Armstrong’s books have a lot to say: they are well-researched, detailed, yet entertaining reads. She wears her scholarship lightly. She might be writing about 4000 years of religious history but every paragraph is gripping. There is so much detail and scholarship that’s it’s impossible to commit all that information to memory, but hers is also a panoramic view of what religion has meant to humankind over the millennia. How once it permeated every aspect of life and how now in the West many people are overtly hostile towards faith, belief, religions. Many people don’t like Karen Armstrong’s views. She has had numerous public debates with ‘New Atheists’ such as Richard Dawkins, Christopher Hitchens when he was alive and Sam Harris. (He is the US critic of religion who will be visiting Australia next January). In June of this year she received an OBE. For services to Literature and Interfaith Dialogue. The myriad awards and honours she has received are too many to list here. But, in 2008, she was awarded a prestigious TED prize and she took the opportunity to use the prizemoney to set up a Charter for Compassion. Unveiled in Washington, its signatories include the Dalai Lama and Archbishop Desmond Tutu. People across the globe have used it to affirm their belief that religion has a key part to play in compassion and tolerance. The Charter for Compassion has a website that is worth a look and which sets out the actual terms of the charter clearly and simply. 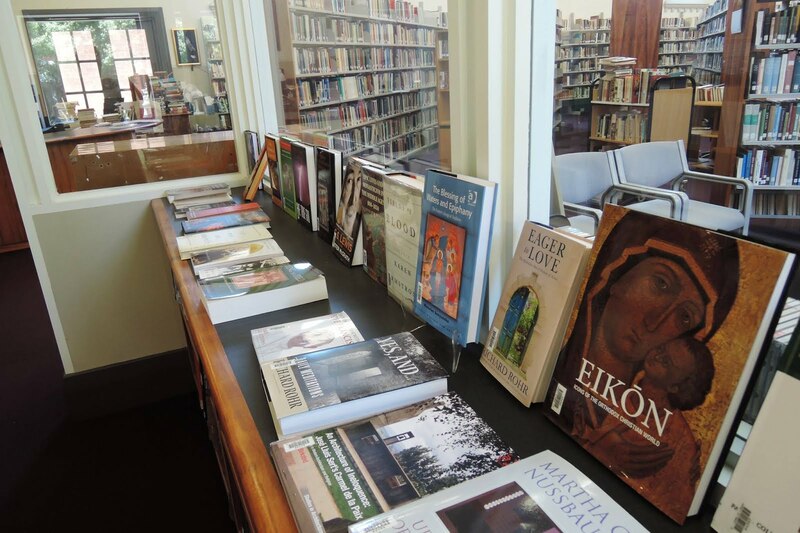 This is the text of the fourth Carmelite Library Lecture for 2015, delivered by Anne Hunt on the eve of the Feast of Saint Teresa of Avila. The lecture brought to a formal close our year of celebrations for the 500th anniversary of Teresa’s birth in 1515. Teresa, in the book of her life which she wrote at the request of one of her spiritual advisors, tells us of a remarkable event that she experienced in Lent 1554 when she was 29 years old and which had a profound effect on her. In the National Gallery of Victoria on St Kilda Road in Melbourne there is a beautiful example of the kind of statue that Teresa saw that day in the convent of the Incarnation and which always reminds me of Teresa. 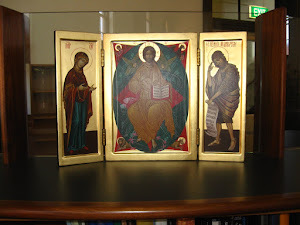 It is entitled The Derision of Christ (see http://www.ngv.vic.gov.au/explore/collection/work/104424/). 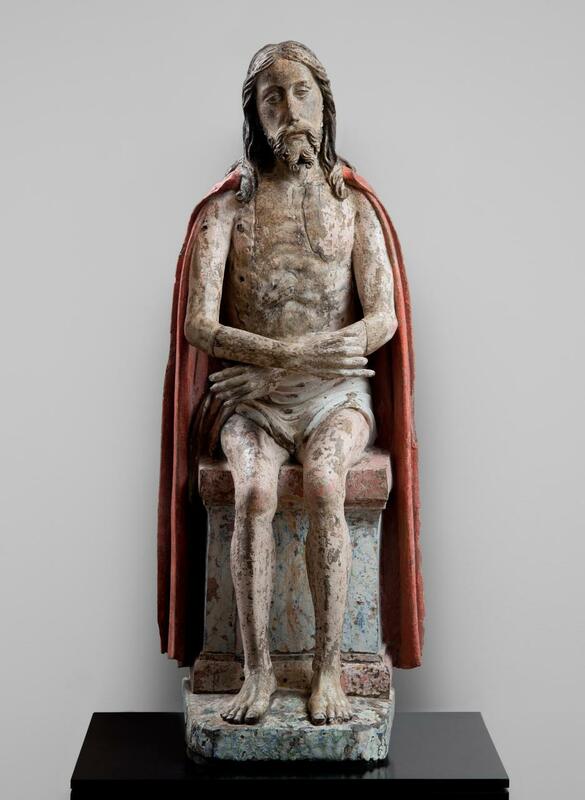 This monumental near life-sized sculpture, dated to the 1450s, depicts Jesus Christ in an episode prior to his execution by crucifixion, when he is being mocked by Pilate’s soldiers in regard to the claim that he was ‘King of the Jews’; hence the title of the work, The Derision of Christ. Christ has been stripped to a loin cloth and flogged. His shoulders have been draped with a red robe, his wrists bound with cord (now missing), a crown of thorns (now missing) placed on his head and a palm frond placed in his hand to stand between his knees as if a sceptre (now missing), all in mockery of the title ‘King’. There is no mistaking his suffering. His body is clearly emaciated. The figure is sculpted from a large piece of oak by an unknown artist, and painted in rich polychrome paint. The carving is skilful; see the face, the hair, the ribs and pectorals, the cloak. The figure is hollowed out at the back, in order to minimise the risk of the wood splitting and also to lighten it for carrying during processions. This scupture probably sat in a niche in a church. Holes in the back indicate that it was designed to be taken on public procession especially during Easter week when the passion of Christ – his suffering and death – would be reenacted in processions, passion plays and religious rituals. What is astonishing is that he faces his tormentors calmly, silently and with great dignity, indeed majesty. The expression on his face is one of mercy and compassion. The sculpture is designed to create an atmosphere of reverence and deep compassion, and to foster an appreciation of Christ’s suffering for the salvation of the human race. Indeed that was precisely its effect on Teresa. Beholding the statue that day was a life-changing and defining experience for her. Christ’s humanity, and Christ’s suffering, would lie very much at the heart of her faith, prayer, and teaching ever after. Therein is the source and ongoing inspiration for her core insights into her understanding of prayer and of our relationship with God. In this talk, I am going to focus on those insights and their application for our lives. I will leave this image on the screen for your contemplation. On the handout you have some of my favourite, and, at least for me, most thought-provoking quotations from Teresa. Really, my talk this evening is built on and around her words and her counsel. It is her words that I want you to hear this evening. Most of you would know, at least in broad details, the story of her life, but allow me to summarise them briefly. Her birth in 1515 in Avila in Spain. Her childhood - her mother died when she was 14 years old. She was a Christian of Jewish descent. Her grandfather was a Toledan cloth merchant, and a converso (a convert to Catholicism) from Judaism. As such, he was marginal to society. He suffered gross humiliation and dishonour at the hands of the Inquisition when, accused of judaising, he was forced by Inquisitorial authorities to submit to an auto-da-fe and, in punishment, to wear the humiliating sanbenito (a penitential scapulary garment) for seven Fridays in public penance for his offence. The shame of this event, together with the prevailing preoccupation with notions of honour and status in Spanish society at that time, had an enormous impact on her understanding of community life as a community of equals. Her entry into religious life at the convent of the Incarnation at 20 years of age. That momentous religious conversion experience (mentioned above) in 1554. Her experience of remarkable mystical graces or favours – especially the experience of transverberation in 1559 when the angel plunged the dart into her heart (famously portrayed in Bernini’s sculpture in Rome; see http://www.britannica.com/topic/The-Ecstasy-of-Saint-Teresa). Her profound consciousness of God’s presence to her in her life. Her work of reform of the Carmelites, including her foundation of seventeen Carmels, including two for men (and, as far as I know, she is still the only woman who founded an order for religious men). Her struggle with chronic ill-health for most of her life; although physically fragile she was psychically strong, however. Her death in 1582 (4/15 October) – at the time of the introduction of the Gregorian calendar (which included a ten day adjustment). Her writings, written for her sisters, which are highly and widely esteemed as religious classics: Book of Her Life, The Way of Perfection (a book of advice and counsels, a pedagogical work), The Interior Castle (her mature teaching; the most doctrinal), Foundations (concerning the establishment of the reformed order), and Spiritual Testimonies (about sixty short reflections on various topics, which I particularly love). Her voluminous correspondence, of which about 500 letters have come down to us, many of them very inspiring. The rich imagery she invokes in describing the life of prayer and our relationship with God (hedgehog, silkworm, garden, and, of course, the castle). My talk’s title this evening comes from Teresa herself, from the very last section of her work, Interior Castle, where she herself counsels her readers not to be building castles in the air. I will return to that point later. Teresa was not a learned woman. She was not scholastically trained. She could read and write Spanish. She read Augustine’s Confessions. She was biblically literate. She knew the Sacred Scriptures through the liturgy (as vernacular translation of the Scriptures was forbidden) at this time. She had not learned from books as such. When vernacular books were taken away by the Inquisition, she came to recognise Christ as the living book. What is very clear from her writings and from those who knew her is that she was a vibrant and vivacious personality, a shrewd and enterprising business woman, a skilful administrator, an astute reader of people, with a great gift for friendship and community. She was also a loyal and faithful daughter of the Church. There was never a question of anything but loyalty and perseverance. The Inquisition (begun in 12th century) in Spain was particularly harsh and punitive. It exercised almost unlimited power and was a cause of great fear. It was a source of pressure on Teresa. (As previously mentioned, her grandfather had suffered greatly at its hands.) Teresa had to contend with virtually constant suspicion and surveillance (from within and without). She had to be as wise as serpents, as innocent as doves (Mt 10:16). The Protestant Reformation: Martin Luther had famously nailed his 95 theses concerning abuses of the Church in doctrine and practice to the church door in Wittenberg in 1517. Christianity was shaken to its very roots and torn asunder. Teresa was particularly distressed by the destruction of images of Christ and of the saints as Protestantism swept across Europe. She had a keen respect for the imagination and for the profitable use of religious imagery to foster devotion. The Council of Trent (1545-63) was the Catholic Church’s response to the Protestant Reformation. The Aristotelian view that women were a mistake of nature, an aberration, and that they were guided by passion rather than intellect prevailed among scholastic theologians of the time. She speaks about God and life from her actual experience. Teresa’s relationship with God was real, deep and practical. At the core of those insights are those regarding prayer: how to pray, when and what to pray, what is prayer. (Not that she teaches a method of prayer as such, but rather the forms of prayer). Let us now attend to some of the insights and advice which Teresa offers in regard to prayer. Later we will look at some practical ramifications of her teaching for our lives as Christians in our time and place. For Teresa, prayer is quite a simple and straightforward matter. With exquisite simplicity she writes: “For mental prayer in my opinion is nothing else than an intimate sharing between friends. It means taking time frequently to be alone with Him who we know loves us. In order that love be true and the friendship endure, the wills of the friends must be in accord” (Book of Her Life 8,5, with my italics). The will is in accord – and this is of paramount importance. As we grow in realisation of God’s immense love for us, we grow in authentic self-knowledge – the knowledge that we are treasured and loved, albeit all undeserved, for we are so unworthy and sinful. We grow and are conformed closer and closer in accord with God’s will. “Thy will be done,” as we pray in the Our Father. She had great love for the Our Father. “Thy will be done.” Always and in everything. Be it in our prayers of petition, be it in our suffering, even in our death. She writes of her longing to die and to see God face to face: "I am consoled to hear the clock strike, for at the passing away of that hour of life, it seems to me I am drawing a little closer to the vision of God" (Book of Her Life 40, 20). But, greater than this, of far greater importance than this, is doing God’s will. Like St Paul she writes of wanting to die but, most of all, of wanting God’s will. So she writes: “This surrender to the will of God is so powerful that the soul wants neither death nor life, unless for a short time when it longs to die to see God . . . there remains the desire to live, if He wills, in order to serve Him more” (Spiritual Testimonies 40). And God’s will is always the life of practical love of neighbour and charity in community. But notice also her comment: Who we know loves us: At the very bedrock of Teresa’s consciousness and insights is the dazzling mystery of God’s immeasurable love for us, not just us collectively, but for her (and you and me) personally, intimately, deeply, unqualifiedly. She has an abiding profound awareness of the boundless love of God for us, that we are to know and know deeply and utterly surely that we are loved, immeasurably, and that, as such, we are fundamentally good! She urges us also to remember that God’s immense love for us does not depend on our earning it. All is gift; all is grace. Hence, she speaks with utter confidence that “we are to speak with Him as with a father or a brother or a Lord or as with a spouse” (Way of Perfection 28, 3). To pray, then, is to converse with one who we know loves us. Teresa distinguishes between mental (or interior) prayer and what she calls vocal prayer, in other words, set prayers and devotions (i.e., using authorised words and devotional forms). By mental prayer, she means that personal intimate sharing by friends. It is unscripted. It is not so much talking to (or at) and/or saying things to but being with. She wants our prayer to be “not with lips alone,” but our whole selves, our very selves. She writes: “A prayer in which a person is not aware of whom is speaking to, what he is asking, who it is who is asking and of whom, I do not call prayer no matter how much the lips move” (Interior Castle 1, 1, 7). Keep in mind that at this time in the Church, mental prayer was highly suspect and actively discouraged. Moreover women’s spiritual capacities were disparaged. Teresa was so attuned to God that she could find God easily, even among the pots and pans (and she was by no means above cooking and washing up and cleaning). She understands that there is no place where God cannot be found. Teresa would have us understand that God is not “somewhere else” but rather that God is always already there”. St Augustine’s writings and insights resonated with her own insights. For her, it is just as St. Augustine (in Confessions) prayed, “You were inside, but I was outside. You were with me, but I was not with you.” Here lies her insight that our soul is like an interior castle. She suggests that “we consider our soul to be like a castle made entirely out of a diamond or of very clear crystal, in which there are many rooms, just as in heaven there are many dwelling places” (Interior Castle 1, 1). God is there, within, in his immeasurable love, there at the centre. What we thought was the periphery, outside of us, is in fact at the centre, indeed more interior to us than we are to ourselves. She assures us: “Once you get used to enjoying this castle, you will find rest in all things, even those involving much labour, for you will have the hope of returning to the castle which no one can take from you” (Interior Castle VII, Epilogue, 2). Most vitally of all: “the door of entry to this castle is prayer” (Interior Castle II, 1, 11). Hence her advice, her strong advice, at the very end of Interior Castle: “We shouldn’t build castles in the air” (Interior Castle VII, 4, 15). Firstly, we shouldn’t be building castles in the air; but we shouldn’t be building castles at all. The castle is within; it is there; God is there; it is for us to enter; the door of entry is prayer. So, like St Augustine, she urges us to recognise that God is not exterior to us, but within us, ever inviting us to enter, to enter the castle, and to enter into ever deeper relationship with God. So, the journey is a journey within. And there is no disjunction between the interior and exterior, but rather a heightened integration. Similarly there is no disjunction between the active and the contemplative aspects of our lives. It is this heightened integration, this heightened consciousness, that shines so brightly in Teresa, that she exemplifies so strongly, and to which she calls us! She reminds us: “The soul is capable of much more than we can imagine” (Interior Castle 1, 2, 8). She tells her sisters that “to get used to solitude is a great help for prayer” (Way of Perfection 4, 9). She stresses: “I’m not asking you to do anything more than look at Him” (Way of Perfection 26, 3). She had an abiding sense of Jesus ever present at her side (Book of Her Life 27, 2). She writes: “A much greater love for and confidence in this Lord began to develop in me when I saw Him as one with whom I could converse so continually. I saw that He was man, even though He was God; that He wasn’t surprised by human weaknesses; that He understands our miserable make-up, subject to many falls on account of the first sin, which He came to repair. I can speak with Him as with a friend, even though He is Lord’ (Book of Her Life 37, 5, my italics). She assures us, especially in times of suffering in our lives: “Whoever lives in the presence of so good a friend and excellent a leader who went ahead of us to be the first to suffer, can endure all things. The Lord helps us and never fails; He is a true friend” (Book of Her Life 22, 6). She repeatedly stressed the importance of focussing on Jesus’ humanity. “I see clearly, and I saw afterward, that God desires that if we are going to please Him and receive His great favours, we must do so through the most sacred humanity of Christ in whom He takes His delight. Many, many times have I perceived this truth through experience” (Book of Her Life 22, 6). She discovered that, if she concentrated her attention on those scenes in Christ’s life when he was alone and in need, she could habitually recollect herself. Indeed she favoured being alone with him in those moments when Christ is alone. She found comfort especially in the passion, and particularly the garden scene of Gethsemane where Jesus was so very alone and afflicted. There she strove to be His companion, a person in need, so that He had to accept her. She explains: “It seemed to me that being alone and afflicted, as a person in need, He had to accept me. I had simple thoughts like these” (Book of Her Life 9, 4). Her approach to prayer is one of recollection, a gentle drawing inward of the faculties, a withdrawal from exterior things into the inner spiritual, and of presence, of being fully present to God and opening ourselves to God’s presence to us. It is recollection because, as Teresa explains, “the soul collects its faculties together and enters within itself to be with its God” (Way of Perfection 28, 4). It “is not a silence of the faculties; it is an enclosure of the faculties in the soul” (Way of Perfection 29, 4). She compares this to “a hedgehog curling up or a turtle drawing into its shell” (Interior Castle IV, 3, 3). Teresa places great emphasis on humility. Humility is key to the self-knowledge that is vital to authentic prayer, that deep sharing with the Lord. Teresa understands that authentic self-knowledge only comes in relation to our knowledge of God. Teresa writes: “It is a shame and unfortunate that through our own fault we don’t understand ourselves or who we are. . . . Because we have heard and because faith tells us so, we know we have souls. But we seldom consider the precious things that can be found in this soul, or who dwells within it, or its high value” (Interior Castle 1, 1, 2). Indeed Teresa really wants to know herself as God knows her, because she realises that God loves her far more than she could ever love herself. This is just as true for all of us. Teresa recognises that authentic self-knowledge is possible only in the light of God’s great love for us. In other words, for Teresa, humility is grounded in the true knowledge of ourselves that is revealed to us in the light of God’s immense love for us. There, in the light of God’s love, we see ourselves, as Teresa saw herself, as loved and treasured and, at the same time, as sinful, unworthy, as a miserable wretch or worm, as Teresa occasionally speaks of herself. There is no question of Teresa wallowing in self-contempt or self-pity, but rather of recognising and accepting a very realistic assessment of one’s sinfulness and frailty, and at the same time knowing one is loved, that one’s sins and offences are forgiven. She writes: “Once while I was experiencing great distress over having offended God, He said to me: ‘All your sins are before me as though they were not; in the future make every effort, for your trials are not over’” (Spiritual Testimonies 63). With God’s words, “All your sins are before me – as though they were not,” is a great sense of the forgiveness of our sins. With this self-knowledge, only possible with the realisation of God’s immense love for us, we go into prayer as our authentic selves, warts and all, as we truly are, with no pretensions or pretences. Only then can we actually pray as friend to friend, with that intimate sharing that can only occur between true friends. But humility is key. She often exhorts her sisters: “strive always for humility.” (Way of Perfection 38, 4). She writes: “The truly humble person always walks in doubt about his own virtues” (Way of Perfection 38, 9). She explains that “a great deal of humility. . . is an important aspect of prayer and indispensable for all persons who practise it” (Way of Perfection 17, 1). She warns: “Without it [humility] everything goes wrong” (Interior Castle I, 2, 8). For Teresa, humility is also important as a corrective to society’s misguided pre-occupation with honour and esteem (so strong a feature of society in Teresa’s time), but, even more importantly, as a means of detachment from the world (to things, to false goals, to our self-centred desires etc.) and attachment to God. She would have her sisters understand what she herself had learnt through her experience: “This is true humility: to know what you can do and what I [God] can do” (Spiritual Testimonies 24). Humility comes to bear in very practical ways, in our prayers of petition, for example. She writes: “we don’t know what we are asking for. Let us leave it to the Lord, for He knows us better than we do ourselves. And true humility is content with what is received]” (Way of Perfection 18, 6). Teresa urges us to the practice of three habits in particular (charity, detachment and humility): “The first of these is love for one another; the second is detachment from all created things; the third is true humility, which, even though I speak of it last, is the main practice and embraces all the others” (Way of Perfection 4, 4). Humility is paramount; the others are impossible without it. But there are some other attitudes and virtues about which Teresa teaches. An attitude of gratitude follows from the virtue of humility. She offers an example from her own experience: “One day while I was anxiously desiring to help the order, the Lord told me: ‘Do what lies in your power; surrender yourself to me, and do not be disturbed about everything; rejoice in the good that has been given you, for it is very great; my Father takes His delight in you, and the Holy Spirit loves you’” (Spiritual Testimonies 10). Indeed the Holy Spirit came to figure large in her prayer life. At one time, when she had been struggling with prayer, she sought the advice of a Jesuit priest who advised her to pray to the Holy Spirit. Saint Paul in his letter to the Romans stresses the same point: “In the same way, the Spirit too comes to the aid of our weakness; for we do not know how to pray as we ought, but the Spirit itself intercedes with inexpressible groanings.” (Letter to the Romans 8:26). Teresa was profoundly affected by this experience. Indeed, she would come to a deep insight into the mystery of the Trinity. And more than insight, her prayer life would culminate in profound communion with the Trinity. Teresa recognises that there is no avoiding the question, and the mystery, of suffering in our lives. She writes: “Suffering is the way of truth” (Spiritual Testimonies 32). She had a deep sense of the paschal mystery of our lives, the passage through suffering and death to new life, the mystery of suffering, whereby the pain points in our lives are the growth points, the points of new life and development. She herself suffered ill-health greatly throughout her life. But she recognised that poor health was no obstacle to spiritual growth, indeed, that it enhances it. She understood that, through it, we learn patience, trust, surrender, hope. It prepares us to receive, makes us ready to receive. It is as if, in our suffering, God hollows us out. But Teresa is no masochist. We are not to seek out suffering. It will come in its own way and time. She calls us to be sensible and to care for our bodies and our health. Teresa learnt much about the mystery of the Cross through her being with Christ in his suffering. She wrote: “If you are experiencing trials or are sad, behold Him on the way to the garden: what great affliction He bore in His soul; for having become suffering itself, He tells us about it and complains of it. Or behold Him bound to the column, filled with pain, with all His flesh torn in pieces for the great love He bears you; so much suffering, persecuted by some, spit on by others, denied by His friends, abandoned by them, with no one to defend Him, frozen from the cold, left so alone that you can console each other. Or behold Him burdened with the cross, for they didn’t even let Him take a breath. He will look at you with those eyes so beautiful and compassionate, filled with tears; He will forget His sorrows so as to console you in yours, merely because you yourselves go to Him to be consoled, and you turn your head to look at Him” (Way of Perfection 26, 5). Like all the saints, she personally deeply knows, and teaches us, the mystery of suffering; that suffering, and ultimately death, lies mysteriously at the core of our lives as followers of Christ. Here, she calls on the image of the silkworm: Just as the silkworm builds a cocoon, buries itself within it, and in due course emerges as a beautiful butterfly, so does the soul bury itself in Christ (Interior Castle V, II). The cocoon is Christ, within whom the soul dies, thus becoming conformed to Christ by dying with Christ. She urges us: “Let it die; let this silkworm die, as it does in completing what it was created to do! And you will see how we see God, as well as ourselves placed inside His greatness, as is this little silkworm within its cocoon” (Interior Castle V, 2, 6). The goal is to make us Christ-like. Just as the silkworm dies in the cocoon, so the soul dies with and in Christ and is conformed to Christ. Christ is the cocoon within which the silkworm-soul dies. Then, when the silkworm is truly dead to the world, the butterfly emerges. So too the soul is transformed, having been placed, through this prayer, within the greatness of God. Later, there is a second death, when the butterfly dies into the mystery of union with Christ, permanently united to Christ (Interior Castle VII, 3). It is in and through this union with Christ that the soul enters into the mystery of the Trinity. One can’t but be struck by a few striking features of her prayer, which we can learn from her with great profit. There is a sense of awe, of a holy fear, of God in Teresa’s prayer. She will lovingly - but in awe - call him His Majesty. She will often refer to his immense majesty. Plus, as its corollary, she will speak of her own sense of unworthiness, referring several times to herself as a miserable worm. It is, once again, that self-knowledge that is securely grounded in truth and in love. But, as we noted before, this is not self-deprecation, it is no grovelling self-denigration. At the same time, she speaks with astonishing directness and there is a palpable freedom and joy – a holy freedom and with it a holy joy - in her relationship with God that flows over into all of her relationships. Indeed, she writes: “This is what we must strive for earnestly, to be affable, agreeable, and pleasing to persons with whom we deal” (Way of Perfection 41, 7). Teresa never fails to bring a very practical and balanced common sense to whatever issue is at hand. She suggests some helpful aids to prayer: spiritual reading (from which she herself profited greatly), reading the Scriptures, and religious art. She had a strong visual aesthetic sensibility and prized images of Christ. Indeed, she advised against renouncing anything that awakens love (Spiritual Testimonies 26). Teresa offers some very sensible advice about prayer and tiredness. “The time of prayer should be shortened, however delightful the prayer may be, when it is seen that the bodily energies are failing or that the head might suffer harm. Discretion is very necessary in all” (Way of Perfection 19, 13). She knows well our human condition and frailties. She counsels us: “Be patient, for as long as you live, a wandering mind cannot be avoided” (Spiritual Testimonies 39). Teresa speaks tenderly of the God’s accommodation to our capacities and limitations: “since He loves us He adapts Himself to its [the soul’s] size,” enlarging it little by little until it has the capacity to receive what he will place within it (Way of Perfection 28, 11-12). Let us also be mindful that she would have us recognise that not all are called to follow the same path. “There are different paths along which God leads souls” (Way of Perfection 6, 5). As she explains, “God doesn’t lead all by the same path” (Way of Perfection 17, 2; 24, 1). She has great devotion and reverence for the Eucharist. “Be with Him willingly; don’t lose so good an occasion for conversing with Him as is the hour after having received Communion” (Way of Perfection 34, 10). But, basically, the major mistake in prayer is not to show up! She assures us that God will come. She urges us: Just turn up (i.e. in prayer). Strike out. Pray, wait, and persevere. God will come. Teresa also offers some cautionary notes. She is in no doubt and advises her sisters that “prayer and comfortable living are incompatible” (Way of Perfection 4, 2). She counsels her sisters (and all of us) not to be looking for extraordinary experiences and mystical phenomena, not to bother about the ecstasies or extraordinary graces; but rather to sweep the corridors and wash the dishes, to do what needs to be done and can be done in whatever situation we find ourselves! In case all of her reflections and teaching on prayer might overwhelm us, she counsels us: “Do not be frightened by the many things you need to consider in order to begin this divine journey which is the royal road to heaven” (Way of Perfection 21, 1). Again, the mistake in prayer - is not to show up. So, strike out. Pray, wait, and persevere. She insists: “The important thing is not to think much but to love much” (Interior Castle IV, 1, 7). The end of prayer, she reiterates, is creative and active: it is “good works, good works” (Interior Castle 7, 4, 6). She never fails to remind her sisters, “the Lord asks of us only two things: love of His Majesty and love of our neighbour” (Interior Castle V, 3, 7). Indeed, she warns them, “if we fail in love of neighbour we are lost” (Interior Castle V, 3, 12). Teresa is in utterly no doubt. Prayer has very practical ramifications. It affects the way we live our lives and relate to other people. Let us turn now to this aspect of Teresa’s insights and the learnings for us that are to be mined there. There are no divided loyalties in Teresa’s insights and application – between serving God and one’s neighbours; contemplation and action; the interior and exterior life; spiritual life and the practicalities of administration (as she demonstrated so well). She writes: “Martha and Mary walk together” (Way of Perfection 31, 5). Similarly there are no divided loyalties between Christ and Church; each of them go hand in hand, fully integrated. She urges us not to be looking for spiritual favours or mystical graces or to be focussed on or pre-occupied with the different stages of prayer that she articulates and our assessment of our ‘progress’. She reminds us: “Perfection as well as its reward does not consist in spiritual delights but in greater love and in deeds done with greater justice and love” (Interior Castle 3, 2, 10). In another place she writes, again adverting to the importance of doing God’s will: “I heard the words: ‘While one is alive, progress doesn’t come from trying to enjoy Me more but trying to do My will’” (Spiritual Testimonies 15). Indeed, she urges her readers, “the more advanced you are in the love for your neighbour the more advanced you will be in the love of God (Interior Castle V, 3, 8). Notice the reversal here. Here in fact is the measure of one’s progress in prayer, Teresa tells us: it is love of neighbour! If you want to know how you are progressing in your prayer life, ask how you are progressing with love of your neighbour (and Teresa means the neighbour right beside you, the people with whom you live and work, those in your immediate vicinity)! Heroics are not what is asked of us, she assures us: “The Lord doesn’t look so much at the greatness of our works as at the love with which they are done. And if we do what we can, His Majesty will enable us each day to do more and more, provided that we do not quickly tire” (Interior Castle VII, 4, 15). There is no Spiritual elitism in Teresa. Her writings and teachings are for all of us. In effect, she calls us to be active contemplatives. And that is essentially - and simply - a matter of awareness, with Teresa herself our model. In other words, she does not call us to radical changes to our life circumstances and heroic feats of prayer, but to very deliberate and conscious attentiveness to the presence of God in our lives, in our very souls, an attentiveness as to one’s beloved, one’s very nearest and dearest friend. With that awareness comes conformity with God’s will, seeing the world and everything and situation in it as God sees it, loving and caring for our neighbours as God loves them, so becoming more Christ-like. In many ways it is quite simple and straightforward. What better way to conclude than with her words: “In sum, my sisters [and brothers], what I concluded with is that we shouldn’t build castles in the air” (Interior Castle VII, 4, 15). The castle is within; the living God is within you, within the castle that is your soul; and prayer is the door of entry: “all one need do is go into solitude and look at Him within oneself, and not turn away from so good a Guest but with great humility speak to him as father” (Way of Perfection 28, 2). Be patient, and persevere.